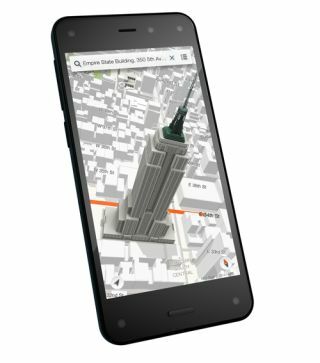 Amazon launches first ever smartphone – the Fire | What Hi-Fi? After cracking the tablet market, the online retail giant makes move into smartphones with "two new breakthrough technologies"
After cracking the tablet market with the Kindle, online retail giant Amazon has announced the launch of the Fire – its first attempt to grab a slice of the increasingly lucrative smartphone market. Amazon will no doubt face stiff competition from established handset manufacturers, but it's hoping "two new breakthrough technologies" will win people over. One of the Fire's two innovations is Dynamic Perspective, which uses four ultra-low power specialised cameras and four infrared LEDs built-into its front face, plus a dedicated custom processor. Its features include 3D visuals that changes the perspective of an image when you move your head; a part of the one-handed gestures feature that reacts to actions such as tilting and swivelling. Dynamic Perspective also promises immersive apps, games and an enhanced carousel that will provide real-time updates from the home screen and allows apps to respond to the actions you make. Meanwhile, Firefly combines Amazon's extensive catalogue of analogue and digital content with audio, text and image recognition to identify addresses, phone numbers and 100 million+ products. Amazon says that means you can make a call using a number printed on a physical poster, or draw up information about an artist based on what track you're listening to and much more. In terms of its specifications, the Fire houses a quad-core Qualcomm Snapdragon 2.2GHz processor; a 4.7in HD display; 4G connectivity; and dual stereo speakers with Dolby Digital Plus. Fire will be available from July 25th exclusively on AT&T in the US, with the 32GB handset coming with a $199 (£117) price tag on a two-year contract. The 64GB model will cost $299 (£176). A quick look at what AT&T has to offer reveals that, at $199, the 32GB model will be the same price as a 16GB Samsung Galaxy S5, 16GB Apple iPhone 5S and 32GB HTC One M8. And if you pre-order now, you will get a 12-month subscription to Amazon Prime as part of a limited time offer – meaning unlimited streaming from the Prime Instant Video and Music services. We're still waiting to hear when the Fire is coming to the UK – and if it will be priced just as competitively here, as it appears to be in the US.